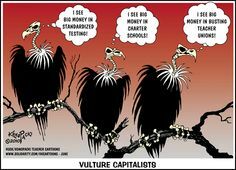 Who would have imagined that public education in the U.S., U.K, Africa and elsewhere around the world would become a target for a hostile takeover by corporate interests? The school privatization movement gathers steam, cleverly and deceitfully branding itself as a 'reform movement.' As they divert resources and students from public schools, which still enroll the vast majority of students, they congratulate themselves for leading a civil rights movement and introducing market discipline into what has traditionally been a government responsibility.The question for the coming decade is whether privatization will undermine and enfeeble public education in the U.S. and elsewhere.' Don't miss this important article on the war on public education!